Keith Randall’s job takes him out in the community as well, though in a different capacity than Hale. Volunteering as CES’s chaplain, Randall is a presence at many family emergencies the department has been called to. Randall’s skills as senior pastor at Peninsula Grace Brethren Church largely come into play when he’s out on a call with firefighters or paramedics, but he said it’s faster paced. 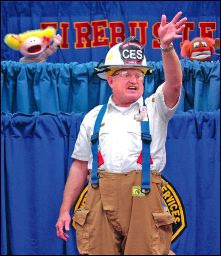 It’s hard to find a school kid here on the Kenai Peninsula who hasn’t met Captain Burn-ee, Hale’s red-nosed alter-ego. And even though Randall’s recognition is somewhat quieter, he’ll often receive acknowledgement from a community member he helped during an emergency. It is Hale’s exuberance, Randall’s empathy and the passion they both display for community outreach that earned them the Public Fire Educator of the Year award and Chaplain of the Year awards.